AQUIS Farm has secured plenty of firepower on its stallion rosters in Queensland and NSW and the brilliantly bred Furnaces (fee $9900, including GST) is a case in point. The young son of champion sire Exceed and Excel hails from a brilliant dam line noted for producing top class stallions including Australian sire greats Heroic and Magpie, top class shuttler Anabaa (USA), English classic winners and sires Never Say Die and Ocean Swell and French champion Klairon. He is yet another stakes winner tracing to classic winner Chelandry (1n), winner of the English 1000 Guineas and runner-up in the Oaks and St Leger, and his dam carries a 3mx3m cross of one of her most influential modern descendants in Summoned. Chelandry had 17 foals and Sir Charles Leicester, in his book Bloodstock Breeding compiled in the 1950s, described her as one of the great tap roots the world over. The 2017 edition of Stallions shows just how strong Chelandry’s influence remains on our thoroughbred population as her descendants listed are Pluck (USA), Teofilo, Dissident, I Am Invincible and of course Furnaces. Two of her daughters, Yippingale (The Trump, Chicola, Victory Lad) and Chersonese (Heroic, Baystone, Jetball) established strong branches in Australia, although Furnaces descends from her daughter Skyscraper (Ayrshire), a very good two and three year-old in England where she placed in the 1000 Guineas and the Oaks. Her son Syce (GB) (Cyllene) was a good sire in Australia, leaving the Newmarket/Oakleigh Plate winner Molly’s Robe among 16 stakes winners and the dams of 21 stakes winners including champion juvenile Mollison and Melbourne Cup winner Old Rowley. Chelandry (Goldfinch-Illuminata by Rosicrucian) was foaled a long time ago (1894) as she is the 14th dam of Furnaces and his particular branch of this family came to Australia in June 1976 when Souran Vanian imported the Pardao mare Sweet Life (GB) in foal to Habitat on an October 1975 cover. The resulting filly foal raced as Sweet Habit and finished third in the 1979 Golden Slipper-Gr.1. Sweet Life and her filly foal quickly found a new owner in the shape of motor dealer Norman Booth (Midlands Lodge, Oberon) and the mare became a noted producer, first for Booth and on his death for Booth’s daughter Barbara and her husband Peter O’Donnell who purchased the former Puen Buen Stud at Scone in the late 1980s and renamed it Pine Lodge after their former property at Oberon. Norman Booth sent Sweet Life, whose fifth dam Galatea won the 1939 English 1000 Guineas and Oaks, to the beautifully bred Dewhurst Stakes-Gr.1 winner Crowned Prince (USA) (Raise a Native-Gay Hostess by Royal Charger), a brother to Kentucky Derby-Gr.1 winner Majestic Prince and from the immediate family of His Majesty (dam sire of Danehill). Her filly by this horse was sold to bookmaker Col Tidy and named Summoned. Although she was unraced she became an outstanding producer, her 13 winners including the champion sprinter and sire Zeditave (The Judge); the Gr.3 winner and short-lived sire Alannon (Noalcoholic), whose only crop included the Gr.1 winner and sire Falvelon; Gr.3 winner and producer Zedegal (The Judge) and Gr.3 winner and stakes producer Pampas Fire (by Prince True (USA), a son of Majestic Light by Majestic Prince). Two fillies who were minor winners also became good producers, Great Verdict (Christmas Tree) produced the South African champion and sire Grey’s Inn to a mating with Zabeel, while True Verdict (The Judge) left Verocative, the Gr.3-winning dam of Gr.2 winner and Jet Spur (Flying Spur), a successful sire in Queensland whose daughters should suit Furnaces. Pampas Fire, who won at 900m and 1000m, was a very smart early juvenile performer winning the VATC Debutante Stakes-Gr.3. She was runner-up in the Maribyrnong Trial-LR and third in the Maribyrnong Plate-Gr.2 and is the third dam of Furnaces. Her five winners include the Debutante Stakes-LR winner Cloister (Marauding), dam of the T.J. Smith-Gr.1 winner Melito (Redoute’s Choice), who won $1.93m and is now at stud in Ireland after being sold to Coolmore at auction for $1.65m. Other descendants of Pampas Fire include current star three year-old Pariah (Redoute’s Choice), You’re So Good (Savabeel), who has already produced fillies by Deep Impact and Snitzel for Arrowfield, and champion NZ 3YO Filly Shikoba (Chief Bearhart (CAN)). The second dam of Furnaces is Bon Fire, a winner at 1400m and a daughter of Horse of the Year and 10-time Gr.1 winner Octagonal (Zabeel), sire of champion Lonhro. Octagonal’s dam Eight Carat (GB) produced five Gr.1 winners and mares with her name in their pedigrees are also worth considering as potential mates for Furnaces. Bon Fire’s three winners include the stakes placed Heat of the Fire, who won over 1150m at two and was runner-up in the Keith Mackay-LR and Silver Shadow-Gr.3. She introduces the second strain of Summoned into the pedigree as her sire Strategic, who counted the William Reid-Gr.1 and Silver Slipper-Gr.2 among his seven wins is a son of Zeditave (14 wins, five Gr.1, 1000m-1600m, including Blue Diamond, Futurity, Lightning, William Reid). Heat of the Fire carries Summoned 3mx3f. of more than $45m including 28 stakes winners, but unfortunately his best son Meurice (dam by Danehill) died before he could go to stud. His daughters have produced the winners of more than $33m, their 17SW including four at Gr.1 level, Le Romain (Hard Spun), Holler (Commands), Griante (Good Journey) and Sonntag (Teofilo). Furnaces is a home-bred son of Darley-based champion sprinter Exceed and Excel (Danehill (USA)-Patrona by Lomond) whose seven wins included the VRC Newmarket-Gr.1 and MRC Invitation-Gr.1. Champion Australian Sire in 2012-13, his major runners here among more than 130 stakes winners include Guelph, Flamberge, Overreach (Golden Slipper), Earthquake (Blue Diamond) and Gr.1 winners and sires Helmet, Excelebration (IRE) and Reward For Effort. Also a northern hemisphere sire success, his runners there also include Breeders’ Cup Juvenile Turf-Gr.1 winner Outstrip and Nunthorpe Stakes-Gr.1 winner Margot Did. He is the sire of more than 1000 winners with earnings topping $130m. 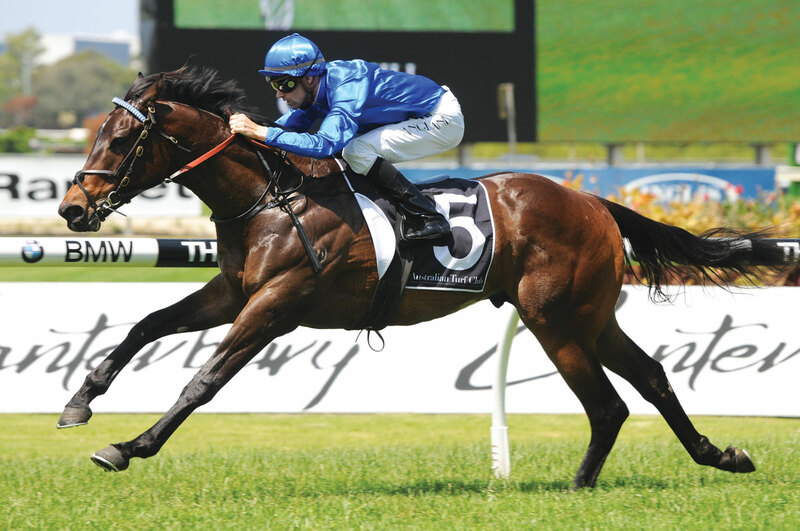 Darley has retained breeding rights in Furnaces and will support the young stallion. Exceed and Excel, who commands a fee of $110,000 at Darley Kelvinside in NSW, was Australia’s Champion Sprinter of 2003-04 and is one of the best sons of nine-times Champion Australian Sire Danehill (USA) (Danzig-Razyana by His Majesty), a horse also carrying 3mx3f inbreeding, this time to influential mare Natalma, dam of Northern Dancer, a horse who appears 3mx3m in Exceed and Excel’s pedigree. The second line of Northern Dancer comes via Exceed and Excel’s dam Patrona (USA) as her sire Lomond, winner of the English 2000 Guineas-Gr.1 is by that horse. Lomond is a half-brother to US Triple Crown winner and champion sire Seattle Slew and their dam, the Gr.2 winner My Charmer (Poker), is another inbred 3x3, this time to the sisters Striking and Busher (War Admiral-Baby League by Bubbling Over), granddaughters of La Troienne. My Charmer’s fourth dam Myrtlewood (Blue Larkspur) is also fourth dam of Mr. Prospector. Patrona also carried two US champions in her immediate pedigree, her dam, the tough Gr.3 winner Gladiolus, is by Watch Your Step, a juvenile stakes winner by Triple Crown winner and 1948 Horse of the Year Citation (Bull Lea) and her second dam Back Britches is by Kentucky Derby winner Carry Back (Saggy), winner of 21 of 61 starts, also including the Preakness and the Met Mile and the Champion 3YO Colt of 1961. Descendants of My Charmer, through her sons like Seattle Slew and Seattle Dancer (Nijinsky) could work well with Furnaces, especially mares carrying Air de France, a Seattle Slew son who traces to La Troienne or daughters of former Darley shuttler Bernardini (USA), a son of A.P. Indy (Seattle Slew). Furnaces also has an extra line of Northern Dancer via his dam as Octagonal’s sire Zabeel is from Lady Giselle (FR) by Nureyev (Northern Dancer). Furnaces was in the first three in seven of his 11 starts, winning by 6.25 lengths over 1100m at Rosehill on debut in October of his juvenile season. Sent for a break, the John O’Shea-trained colt was second to Haptic (Wolf Cry third) in the 1100m Lonhro Plate-LR at Randwick on February 14 and then won an 800m trial before a second behind champion juvenile Vancouver in the Todman Stakes-Gr.2 (1200m) on March 7 and then a close sixth of 16 behind that horse in the Golden Slipper-Gr.1. Furnaces was off the scene until the following September when 2.25 lengths third behind champion Chautauqua and Gr.1 winner Flamberge in the Ian McEwan-Gr.2 (1000m) at Moonee Valley. He resumed with an unplaced run in the Fireball-LR at Randwick on March 5, 2016 and then won the rich Hawkesbury Gold Rush Plate (1100m in 1:01.35), breaking the track record, before fifth in the Listed Ortensia at Scone. Given a break until September 3, he was runner-up to Wild Rain in the McEwan-Gr.2 (Heatherly third) and won a trial later that month before being retired after dissapointing in the MRC Schillaci-Gr.2 behind Star Turn on October 8. His three wins, three seconds and a third gained him prize money of $475,950.